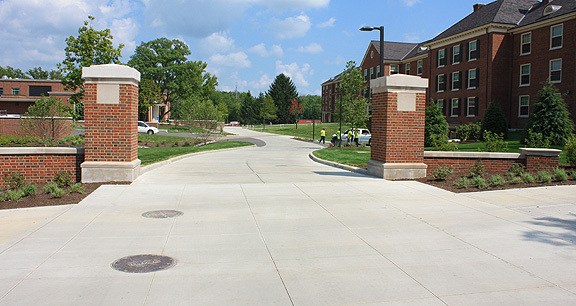 Project obstacles and solutions: Miami University at Oxford, Ohio is undergoing a renovation of its North Quad housing and dining facilities. Construction began in the spring of 2015 and was completed during the summer of 2016. Besides updating underground utilities, all of the hardscapes in the North Quad were rebuilt to accommodate today's students. That included biking and walking paths, along with driveways and docking areas for service and emergency vehicles. Whiting Turner was the construction manager for the North Quad project. Vertical Concrete poured all of the colored and decorative concrete areas. Vertical and Schumacher Dugan Construction poured all the other concrete hardscapes. The new design called for 2,500 yards of concrete to be used on the hardscapes. The landscape architect designed areas that would be accented with exposed aggregate concrete that used pea gravel in the mix. The design also called for a black colored concrete. Rather than using a coloring additive, IMI QC/QA incorporated Black Beauty Sand as one of the fine aggregates in the mix. Black Beauty is a slag product that is crushed and can be used as a replacement for natural sand in a concrete mix. IMI did extensive testing to produce a dark colored concrete for this project. Due to its rather coarse and angular shape, Black Beauty glistens as sunlight reflects off of it. Vertical Concrete poured 200 yards of decorative concrete colored with Black Beauty sand. For more information on adding color to your concrete, click here or contact the sales representative for the concrete plant nearest your location. Click here.